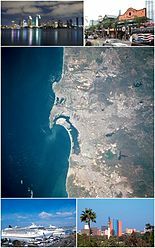 The Tijuana metropolitan area, and in Spanish the Zona Metropolitana de Tijuana, is located on the Pacific Ocean in Mexico. The 2010 census placed the Tijuana metropolitan area as the fifth largest in the country with 1,751,302 persons. The census bureau defined metropolitan area comprises two municipalities: Tijuana and Rosarito Beach. Yet sources commonly include Tecate Municipality in the metropolitan area as the urban area between Tijuana and Tecate grows, the commuting populace increases - ultimately further developing the southern areas of San Diego–Tijuana, and the three municipalities maintain strong relationships and cooperation. ^ "Metropolitan Tijuana The Baja Triangle". Transborder Communications. Retrieved August 4, 2011. ^ "MEXICO: Baja California". Citypopulation.de. January 8, 2012. Retrieved June 1, 2012. This article about a location in the Mexican state of Baja California is a stub. You can help Wikipedia by expanding it. ^ "Delimitación de Zonas Metropolitanas de México" (PDF). INEGI. Retrieved September 22, 2018. This page was last edited on 26 February 2019, at 19:59 (UTC).